As some of you know, we're in Japan right now, and it's blazing hot. However, I didn't want this week to pass without posting up some photos from the IDC (International Drift Challenge) drift event we went to this past weekend at Nurburgring. The event was held at the Nurburgring Grand Prix track, which is way different from what we experienced at Nordschleife (North Course)… but Nordschleife is just an entirely different animal than most racetracks I've experienced. While I had fun shooting the IDC event and meeting the German drifters, it was unfortunately muggy during the event. In my opinion, Nurburgring's Grand Prix course is kind of far away from the spectators, so I was thankful to Soeren and Vanessa from IDC for getting us track access so we could get a bit closer! The photo above is an E36 BMW 3-series wagon (I think in Germany they refer to these as touring models) driven by Paul Vlasblom from the Netherlands. Here's some of the spectators watching from super far away. They are a dedicated bunch, those IDC spectators! 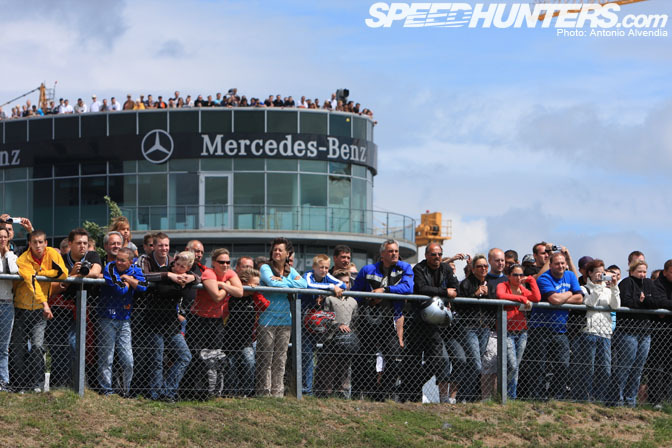 I think in the future, it would be great for Nurburgring to install grandstands (in Germany, they call these tribunes) in these spots, so that the fans can chill out and sit down while they're cheering for their favorite drifters! Federico "Lo Sceriffo" was the certified cool guy at the event. He just received his license to compete in the IDC events; he and his crew made the trek all the way from Italy to compete in IDC! 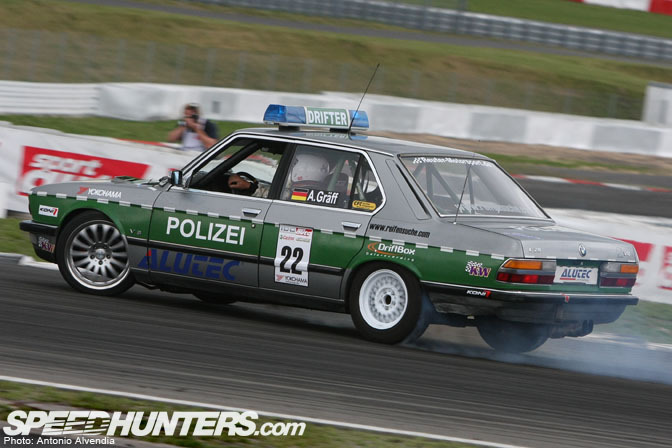 I thought this old school BMW 5 series with Police graphics was soooo cool! My friend Dan Pina drifts in a police-looking Mustang drift car, so I thought it was real cool to see a Polizei themed drift car in Germany! Here's some of my new friends drifting together! Graff vs Yves Faber! This Hankook Tire sponsored 318ti was one of the most professional looking cars at the event, with graphics that matched the liveries of the Hankook cars that compete in the US. There was also a Falken Germany team, but they didn't make it to the final tandem competition. Here's Paul Vlasblom again, with his E36 wagon. He actually won the event overall – Vlasblom from Holland is one of the more consistent drivers in the IDC series. 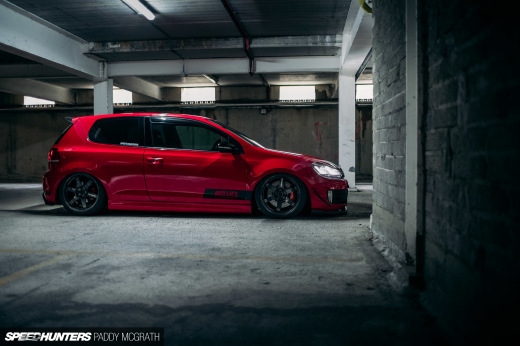 Our fellow Speedhunter Jeroen was happy to see his fellow Nederlander representing! Look at this 5 series BMW drifting with our boy Federico from Italy (driving the Subaru WRX). Nice to see 5 series Beamers like this drifting in Germany, because I don't recall seeing many 5s like this in the USA – except for the Tertech brothers from South Florida. 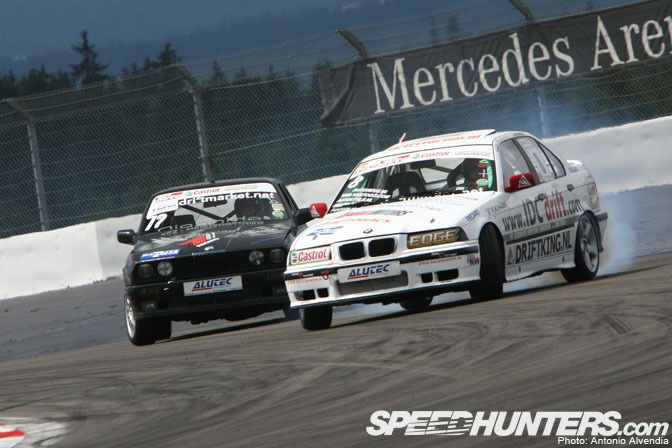 E30 wagon vs E36! I was trippin out, I've never even seen an E30 wagon before in my life! I didn't know E30 wagons even existed! This trip was a good one for me; it exposed me to more of the European car scene, instead of the Japanese car culture I normally focus my attention on. I thought it was really cool that the majority of the IDC drift cars were BMWs! What do you guys think? Good Lord. 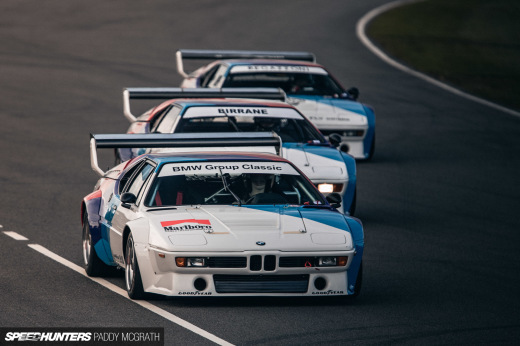 It's like a veritable world of BMW drifting. Man, I love to see that. man, ya gotta love drifting wagons...speaking of, anyone know of someone drifting a wagon? 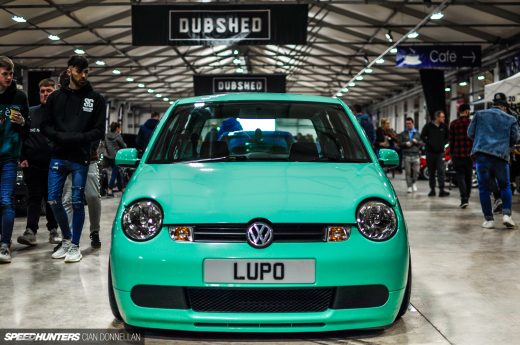 That polizei car wins today's competition of Internets. It's the best thing I've seen all day. i remember seeing an e30 wagon when i went to europe in '99. i was trippin' out too! btw, it's bimmer. and us bmw folk like to call our wagons "tourings". Amazing, a 5.0 drifting in Euroland. 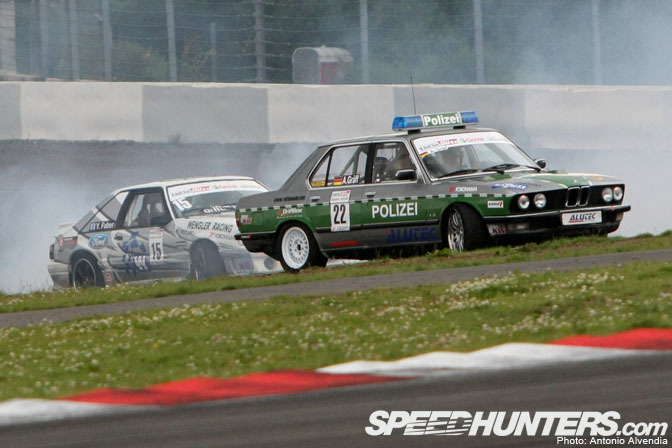 That Polizei beemer* is quite funky. I've allways said Beemer and consider Bimmer to be a North American thing. I've looked it it up and it seems to be a much debated issue, it is common consensus that both terms were derived from motorcycle racing slang. Some say that the motorcyclyes were called Beemer's and the cars called Bimmer's to avoid confusion. Although most of the sites that state this version seem to be of a North American bias. Some people also claim that it is just a different spelling and both words are pronounced the same. awesome work AA. great shots as always. did they pay for you guys to get over there for this event or a magazine etc.? hoep we can work together in the future bro! HaHa to the police car. That is too funny. I'm glad you posted this pic.